Have A Stinky Sink? A Plumber Approved DIY Solution Just For You! Ever Had A Stinky Sink? A stinky sink is something we never think about until it happens. Every day, you fill the sink, wash your hands, and carry on your day without a second thought for the intricacies behind your bathroom’s drain. It’s a whole different story when something interrupts your usual routine. We’ve talked about the reasons why your sink might not be draining, but a clog isn’t always the source of your problems. A free flowing drain can still cause you headaches if it’s particularly dirty and has an odor throughout your bathroom. You can’t ignore it any more than you could a clog. You need to follow a few simple tips to get your drain back to normal. Your bathroom sink sees a lot more than just water flowing down its drain. Soap, toothpaste, hair, shaving cream and other toiletries make their way down the drain and through your pipes. Eventually, these substances build up and create a filmy coating within the pop-up stopper, the drain, and the p-trap of your sink. In some cases, this grime begins to smell. You’ll notice it as soon as it does, as the odors from a stinky sink are hard to miss. Luckily, it’s easy to fix. With just a wrench, some vinegar, and a bit of time, you can clean your entire drain. Before taking these steps, always remember to tell your family that’ll be you working on the bathroom sink. As you’ll be removing parts of the pipes underneath it, you don’t want anyone to unknowingly turn on the taps and cause a flood! Once they’re aware of your plans, you’re good to start your cleaning. Remove the p-trap, the pivot rod, and the pop-up stopper from your sink. All three of these pieces will likely be covered in film and will need extensive cleaning. You can remove most of the gunk using a toothbrush and paper towels. Once the majority of the film has been removed, place these fixtures in your kitchen sink and fill it with warm water and vinegar. While you allow these to soak, return to your sink. Fold a paper towel and push it down your drain, using an appliance brush or a straightened coat hanger to get it through the entire pipe. You’ll want to repeat this process several times in order to scrape all of the film from the inside of the pipe. Your p-trap, pivot rod, and the pop-up stopper will have soaked long enough by the time you’ve removed the film from your drain. Dry them off and reconnect them to your sink, remembering to tighten the nuts properly to ensure water has no means to escape. Once everything’s back in place, run the taps to test your tightening job. If all is well, you only have one step left in your cleaning routine. To ensure you’ve removed all of the remaining film, pour an additional cup of vinegar down the drain and let it sit for 30 minutes. After that time, run the hot water for a full minute to push any remaining sediment down and out of the p-trap. By following these steps, you can eliminate that stinky odor from hanging around your bathroom. We admit that this an elaborate cleaning job, which you probably don’t want to repeat any time soon. To make sure your cleaning efforts last as long as possible, we recommend using GES+® Plus, which is an eco-friendly and biodegradable grease eliminator and drain cleaner. It contains live vegetative bacteria that will keep your drains fresh without harming the environment. Removing and re-screwing these parts can be a scary challenge. You never know what’s going to happen. And you never know what you might run into on the way to find one problem. There’s a possibility of unable to re-screw something back into place or worse, breaking something. As such, should you feel uncomfortable removing any parts of your drain to give them a deep-clean, our plumbers are happy to help you. 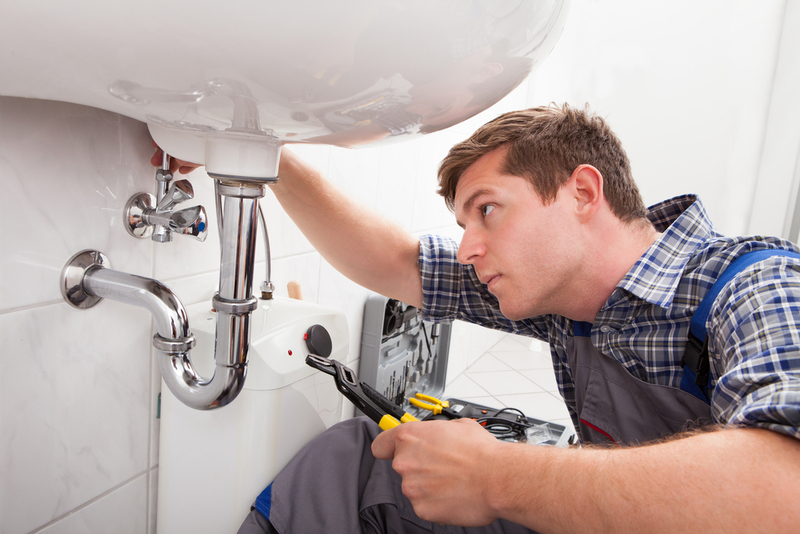 You only need to give us a call, and one of our expertly trained and highly knowledge plumbers will be at your door, ready to fix your stinky sink.